Bus from Ipoh to Malacca is a popular tourist route because Ipoh and Malacca both are the tourists preferred destinations in Malaysia. Tourists and travellers rely on this direct bus service because there is no train and flight service available between the two cities. Therefore, bus is the only public transport for passengers to travel from Ipoh to Malacca. Kesatuan Express and Cepat Express are the two well-known bus service provider serving bus from Ipoh to Malacca. Many passengers like to travel from Ipoh to Malacca with Kesatuan Express and Cepat Express because of their reliable and comfortable bus service. They have combined trips of 4 daily departures. The earliest bus from Ipoh to Malacca goes at 12:30am. The following schedules are 1:30am, 11:00am and 2:30pm. Please note that there is no bus service from Ipoh to Malacca available during evening session. The travel time taken from Ipoh to Malacca by bus is about 5 hours depending on the road traffic condition. At least one stopover will be given by the bus driver along the highway. Extra washroom break will be given during the journey upon request from the bus driver. The bus ticket price is in a range of RM 32.60 to RM 38.00 depending on your selection of bus operator. Child fare is cheaper at RM 30.00 for Kesatuan Express and at RM 24.40 for Cepat Express respectively. The boarding point in Ipoh is located at Aman Jaya Bus Terminal, about 20 minutes away from Ipoh town area. Passengers can get to Aman Jaya Bus Terminal by taking public bus or taxi from Ipoh town. The arrival point in Malacca is located at Melaka Sentral Bus Terminal. 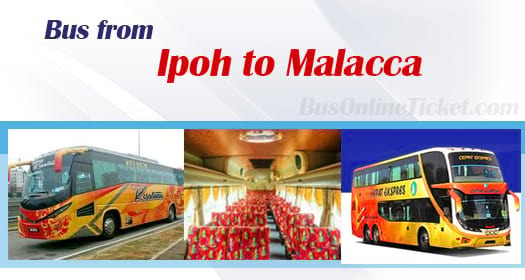 Everyone can book bus ticket from Ipoh to Malacca now with BusOnlineTicket.com. Booking with BusOnlineTicket.com, you can make your payment via our secure payment gateway such as Paypal, Visa and Master credit card, as well as internet banking via CIMB One Click, Maybank2u, Hong Leong Connect, RHB and many more. Instant email confirmation will be sent to you once the payment is received.